World Viscose Fiber Report, Viscose Filament Yarn Production. Global cotton production fell 6% to 24.3 million tons resulting from 6% shrinkage acreage to 31.75 million hectares in 2014-15. 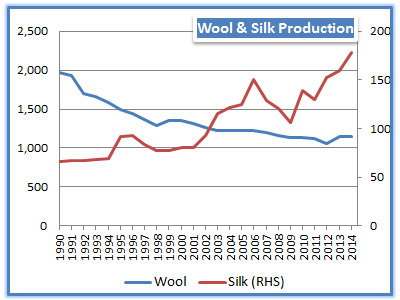 Worldwide wool production dropped 0.4% in 2014 in most major wool producing countries, valued at US$9 billion. Global wool trade fell 5% as exports totaled 931,000 tons in 2014.